Diloti - thanoscardgamess jimdo page! Diloti is a very popular game in Greece. It shares the same principles to the Casino but it requires more sophisticated play by reducing the luck involvement. Capturing, building and sweeps are present here too. Sweeps count as 10 points instead of one. Players have to remember well the cards that have passed. There is also a slightly different counting system since the 'most of cards' points are 4 and there's no bonus for 'most of spades'. 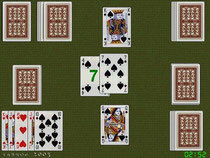 You may play it against one opponent or with a computer partner in a four player team game. Also, you have the option to hear the players tell their builds, instead or showing them in screen. You may select to play it between two french suited decks. Option to play with 4 or 6 cards on hand.